"Federal and state minimum wage increases have had no measurable impact on the use by working-age adults of SNAP, Medicaid, Temporary Assistance for Needy Families, and the Women, Infants, and Children program," states the report. "In some specifications, they find evidence of an increase in the use of free and reduced-price lunches and housing subsidies following minimum wage increases." The report finds that raising the minimum wage to $15, a measure that Sen. Bernie Sanders (I., Vt.) has supported, is a "blunt tool" in helping many get off of government assistance. Only 12 percent of those who would be affected by this new wage are recipients of the food stamp program and 10 percent benefit from Medicaid. When looking at certain groups of minimum wage earners, the report finds that hiking the wage reduces reliance for government assistance for some at the expense of others, creating "winners and losers." For example, after women with less work experience get a higher minimum wage, data finds some reduction in SNAP enrollment. At the same time, non-white employees and young individuals without a high-school diploma saw more reliance on the free and reduced lunch program. 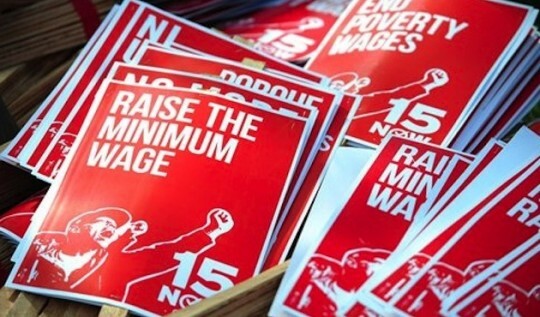 "Proponents of a higher minimum wage have portrayed the policy as a win-win: Higher wages for employees, lower costs for taxpayers, and no consequences to speak of," said Michael Saltsman, a research director at the institute. "It's a pleasant fiction, but the facts don't back it up," he said. "Not only does the research show that a higher minimum wage costs jobs, but a new study finds that it has no net effect on means-test government programs. Policymakers who are serious about helping the poor should look to the evidence rather than to misleading anecdotes offered up by labor unions and the White House."